Fresh cashews are perfect snacks and cooking ingredients. There are so many reasons why we love cashews. They are a feel good food that makes a great snack and ingredient in many different kinds of recipes. What you might not know about cashews is where they come from and how they get to your table. Cashews are native to Brazil and are grown commercially in Vietnam, Nigeria, India, and Indonesia. Considerable labor is required to remove the nut (or seed) from each cashews fruit. Then the nuts are dried and prepared for sale. Cashews are eaten as snacks and also used in cooking. They are excellent in stir fries and also on top of salads. When soaked, they can be ground and blended to make non-dairy cheese. We love their versatility and delicate flavor. They also have several health benefits. Studies have shown that cashews can affect your mood in a positive way. Eating a couple handfuls of this delicious nut can actually make you feel happy, reduce stressful feelings, and produce calmness. The reason cashews can lift your spirits is that they are loaded with tryptophan, an amino acid that help the brain product serotonin which makes you feel good. Cashews also have more magnesium than almonds which assists the nervous system and can reduce anxiety. Lastly, cashews contain healthy fats which are important for brain health. You can order fresh premium cashews on Treatmo from nuts+nuts. 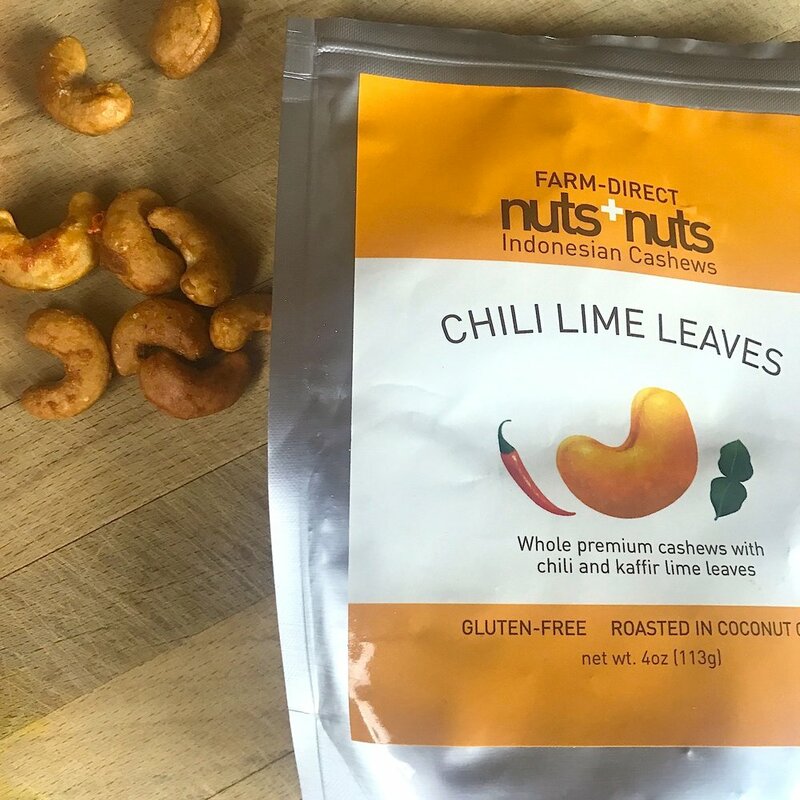 The owners moved from Indonesia to the U.S. and started sourcing the best cashews from small farms in Java and Bali. They work directly with the farms and cut out the brokers and middlemen to bring fairly produced cashews to the U.S. consumers for their snacking pleasure. They come in four flavors: Lightly Salted, Chili Lime, Honey Sesame, and Sweet & Salty. You can order nuts+nuts gourmet Indonesian cashews on Treatmo in a tap for delivery to your home or office. Enjoy them as a snack between meals, after work, and in various recipes. Treatmo lets you shop fresh and locally made pantry items, snacks, and cooking ingredients conveniently from your mobile phone direct from food makers across the U.S. It's free to download and easy to use. Connect with friends about the food you buy on the app's news feed.